스트레이츠타임스는 지난 화요일 South Korea to spend $16 billion in border areas with North Korea for next decade (남한, 향후 10년간 북한과의 접경지역에 160억 달러 투자 예정)이라는 제목의 기사를 보도했다. 기사에 따르면 이 자금은 앞으로 한국 정부가 향후 10년간 북한과의 접경지역에 투자할 액수로 중앙정부 5조4000억, 지방자치단체 2조2000억, 민간 5조6000억이 포함, 2030년까지 이 지역 225개 사업에 투입된다고 밝혀졌다. 또, 행정안전부는 이 자금이 남북교류협력 기반 구축, 지역균형발전 기반 조성, 접경지역의 생태평화관광 활성화 및 사회기반시설 확충 등을 목적으로 하는 사업에 투입된다고 말하면서도 앞으로 10년간 투자의 확대는 남북관계 개선과 지역균형 발전의 필요성 등 국내외 정세 변화를 반영할 것이라고 선을 그었다. 기사는, 13조 2천억의 투자금 중 약 5조 1천 억원은 영종도와 신도를 잇는 2차선 도로 건설을 포함한 남북교류협력 기반 구축을 위한 21개 프로젝트에 배정되며 남북한이 한반도 동부와 서부에 위치한 철도와 도로 현대화와 상호 연결에 합의한 만큼 이 프로젝트에서 서울과 원산간 철도인 경원선의 남한지역구간 복원에 있어 남북한 문화교류센터가 경원선이 통과하는 철원에 건설될 예정이라고 말했다. 한편, 3조 4천억원은 국경 접경지역 균형 개발을 위한 산업단지 조성, 창업환경개선 등을 포함한 54개 프로젝트에 투입되며 비무장 지대 인근의 둘레길 조성과 국경 접경지역의 생태 평화관광 활성화를 위해 3조원 가량이 배정되었다고 밝히고 있다. 다음은 뉴스프로가 번역한 스트레이츠 타임스의 기사 전문이다. 남북한 당국자들이 2018년 12월 26일 분단된 한반도를 가로지르는 도로와 철도를 연결하는 기공식에서 이정표 현판을 공개하고 있다. SEOUL (XINHUA) – South Korea’s government said on Thursday (Feb 7) that it will spend 13.2 trillion won (S$15.9 billion) in border areas with North Korea for the next decade. 서울 (신화) – 목요일(2월 7일) 한국 정부는 향후 10년간 북한과의 접경지역에 13조2000억 원을 투자할 것이라고 발표했다. The money, including 5.4 trillion won from the central government, 2.2 trillion won from local governments and 5.6 trillion won from the private sector each, will be spent on 225 projects in inter-Korea border areas by 2030. 이 자금은 중앙정부 5조4000억, 지방자치단체 2조2000억, 민간 5조6000억이 포함된 것으로 2030년까지 남북한 접경지역 225개 사업에 투입된다. The projects were aimed to establish foundation for inter-Korea exchange and cooperation, lay the groundwork for a balanced regional development, stimulate ecological peace tourism in border areas and expand social infrastructure, according to the Ministry of the Interior and Safety. 행정안전부에 따르면 그 프로젝트는 남북교류협력 기반 구축, 지역균형발전 기반 다짐, 접경지역의 생태평화관광 활성화 및 사회기반시설 확충 등을 목적으로 한다. The development of the border areas had been limited for military security reasons. 국경 접경지역 개발은 군사적 보안상의 이유로 그간 제한되어 있었다. For the past eight years, a total of 2.8 trillion won were spent on developing tourism projects, building industrial complexes and expanding transportation infrastructure. 과거 8년간 관광사업 개발, 산업단지 건설 및 교통 기반 시설확충 등에 총 2조8000억 원이 투입되었다. The expanded investment for the next decade reflected changed situations at home and abroad, including improved inter-Korea relations and the need for balanced regional development, the ministry said. 행안부는 “향후 10년간 투자 확대는 남북관계 개선과 지역 균형발전의 필요성 등 국내외 정세 변화를 반영한다”고 말했다. About 5.1 trillion won was allocated to 21 projects to establish foundation for inter-Korea exchange and cooperation, including the construction of a two-lane road between Yeongjong Island and Shin Island along the country’s western coast. 그 중 약 5조 1천억원이 서해안을 따라 영종도와 신도를 잇는 2차선 도로 건설을 포함한 남북교류협력 기반 구축을 위한 21개 프로젝트에 배정되었다. South Korea and North Korea agreed to modernise and eventually connect railways and roads along the eastern and western Korean Peninsula. 남북한은 한반도 동부와 서부에 위치한 철도와 도로를 현대화하고 궁극적으로 연결하기로 합의했다. 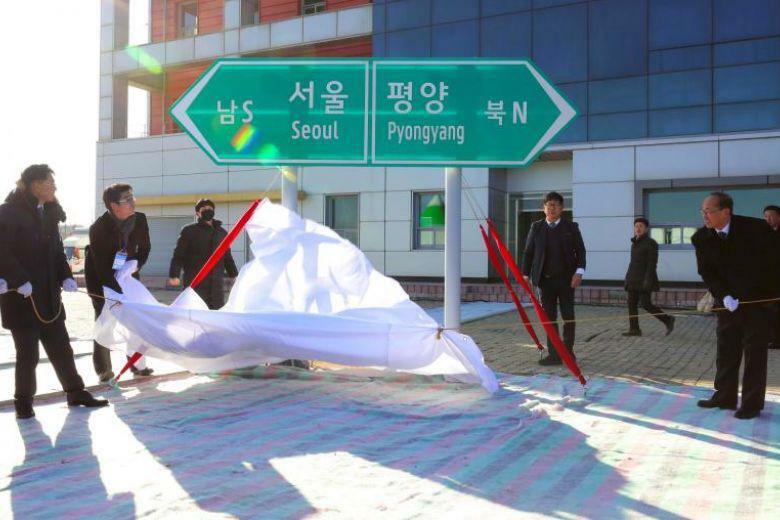 The two sides held a ground-breaking ceremony in December, but the construction had yet to be launched because of international sanctions on Pyongyang. 남북한은 12월 기공식을 가졌으나 국제사회의 대북 제재로 인해 아직까지 공사가 시작되지 않은 상태였다. North Korean leader Kim Jong Un and US President Donald Trump agreed to hold their second summit in late February in Vietnam. The first Kim-Trump summit was held in Singapore in June last year. 김정은 위원장과 도널드 트럼프 대통령이 2월 말 베트남에서 두 번째 정상회담을 갖기로 합의했다. 제1차 김-트럼프 정상회담은 지난해 6월 싱가포르에서 열렸다. Regarding the restoration of the South Korean section of the Gyeongwon Line, a train route between Seoul and the DPRK’s eastern coastal city of Wonsan, an inter-Korea cultural exchange centre will be built in Cheorwon, a border town of South Korea through which the Gyeongwon Line passes. 서울과 북한의 동부 해안도시 원산 간의 철도인 경원선의 남한 지역 구간 복원에 있어, 남북한 문화교류 센터가 경원선이 통과하는 남한 국경도시 철원에 건설된다. To develop the border areas in a balanced way, 3.4 trillion won will be spent on 54 projects, including the creation of industrial parks and the improved conditions for business start-ups. 또한 국경 접경지역을 균형 있게 개발하기 위해 산업단지 조성, 창업 환경 개선 등을 포함한 54개 프로젝트에 3조4000억 원이 투입된다. Some 3 trillion won was earmarked to stimulate ecological peace tourism in border regions, including the creation of a walking tour route near the Demilitarised Zone (DMZ) that has left the Korean Peninsula divided since the 1950-53 Korean War ended with armistice. 한국전쟁(1950-1953)이 휴전협정으로 끝난 이후 한반도를 둘로 나눈 비무장지대 인근에 도보 관광로를 새롭게 조성하는 등 국경 접경지역의 생태 평화관광 활성화를 위해 3조 원 가량이 배정되었다. The remaining 1.7 trillion won was allotted to 42 projects to improve domiciliation conditions, such as the expansion of cultural, sports and welfare centres, and the construction of liquified petroleum gas supply networks. 나머지 1조7000억 원은 문화, 스포츠, 복지센터 확충과 액화석유가스 공급망 구축 등을 포함한 주거실태를 개선하기 위한 42개 프로젝트에 배정되었다.